Mike Tyson is currently on the second round of his one-man show in Las Vegas but in the heavyweight division there is now only one show that can attract thousands upon thousands of fans. Tyson, in his storybook beginning, his menacing best and his psychotic worst was must-see TV, a box office icon you could not take your eyes of. You had to know what happened in his fights if you were to be able to maintain a conversation with anyone on the street the following day. Nowadays the same thing applies to Joshua, only you have a wholesome image and a brand that is accelerating to global if not stratospheric proportions for the right reasons. It is not the ticking time bomb effect. Mainstream endorsements have seen him dominate the commercial landscape domestically. His face and likeness have been everywhere this week, on television, on billboards, online and in any newspaper or magazine you care to pick up. The Principality Stadium was heaving with a record-setting UK indoor crowd of 78,000 in attendance, just 12,000 shy of the Wembley Stadium record he set in April against Wladimir Klitschko. That crowd was understandable. It marked Joshua’s coming out party at the highest level. But this, along with the 15-20,000 Joshua routinely sold out during his climb up the ladder, shows his drawing power and his drawing power alone. This would have sold the same volume of tickets whether Kubrat Pulev, the original opponent, or Carlos Takam was the advertised foe from the get-go. Joshua will keep doing crazy numbers through the turnstiles and on box office regardless of whom he fights. Those who have been around the game since Tyson’s pomp may recall what ‘Iron’ Mike once said he would be able to sell out Madison Square Garden doing, and while one would hasten to subscribe to that kind of profanity or a similar analogy, Joshua will draw a crowd regardless of who he boxes. The vast majority of those who went on Saturday night would not have known who Takam was before. Those same fans would not have known who Pulev was before either, until his mug showed up on the opposite side of the fight poster. He boasts an immense and genuine likeability. There is a section of boxing fans who believe Joshua’s image is too heavily manufactured and they do not want to run with the story that the one-time bad boy has done good and transformed his life, through boxing. But that is a cynical minority. The vast majority is overwhelmingly in favour of him, charmed by his humble demeanour, awed by his power and thrilled by his knockouts. Some booed the premature stoppage of referee Phil Edwards not just because Takam had earned the right to either hear the final bell or go out on his shield, but maybe because they wanted to see the French-based Cameroonian become the 20th opponent out of 20 to crumble before their hero. Takam did not crumble. And even though the distress flares went off when he was badly cut by the right eye early on he battled on. More than that, he kept coming, forcing the fight. Forcing Joshua to fight. In Joshua’s corner, Robert McCracken asked for simple straight shots, a double jab and a right hand. But Joshua instead conceded ground and traded unnecessarily. It’s another reason why he has gone to the hearts of the people. Edwards may have denied them a devastating memento of their evening by cutting the fight short by 10 or 20 seconds, but they got the ending they wanted, if not the manner they had hoped for. It won’t stop them going again, or paying to watch on Sky Box Office. The one-man show rolls on. Astonishingly it will grow. Takam, as tough as the proverbial pair of old boots, did himself proud and therefore allowed the IBF to come out unscathed. Many wondered, quite rightly, what he had done to merit his lofty No. 3 spot in their rankings, but he did not let them down. It made the fight more passable in hindsight than it was beforehand, particularly when you consider that even though the 12-day substitute’s greatest success in the fight was a second-round headbutt, which broke Joshua’s nose, he exceeded the meagre expectations many had of him beforehand. But neither he nor his shaven-skull could derail the Joshua Express. ‘AJ’ will only be able to beat what is put in front of him, and there is not a lot out there. Even if he were to fight and beat Deontay Wilder, Joseph Parker and Tyson Fury, what is out there after that? Yet Saturday highlighted that he still has plenty to learn. That part should be exciting, the fact that there is a heavyweight champion who looks good but who can also drastically improve. And the big fights will come. They are inevitable because Joshua, now 20-0 (20), is the captain of the ship and he wants to sail towards them. Mike Tyson was 18-0 when he was then forced to go the distance in consecutive fights against James Tillis and Mitch Green. But he was not a world champion by then. He was fighting on small shows in upstate New York and had yet to fully dip into the mainstream that would later consume him. He certainly was not box office although, of course, he was far younger. He was only 19 or 20 at the time he was 18-0. Joshua is 28. Still, the one-man Tyson show, which careered along for another decade or so never sold more than 160,000 tickets for back-to-back fights. Wilder may want to fight Joshua in the USA. And to be a world champion, one should travel at some point or other. But more and more that is not the case in boxing. Where did Floyd Mayweather fight? How often were the Klitschkos on the road in their primes? Andre Ward? Terence Crawford? 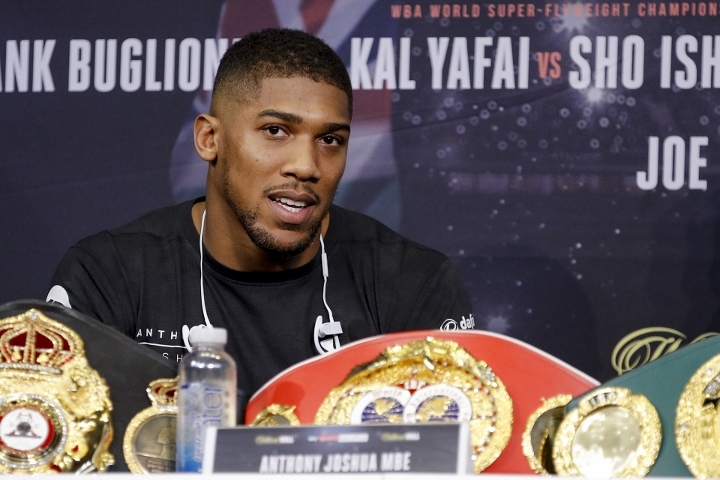 They have competed where the money is for them and one look at the Principality Stadium in Wales this weekend – or Wembley last April – tells you where the money lies in heavyweight boxing. The division might have multiple claimants to its throne, whether their entitlement is lineal or in the shape of championship hardware, but there’s only really one man running the heavyweight show.